In the following section, we will illustrate how to integrate Bizagi with SAP without the need of programming. This integration is easily set up through the out-of-the-box feature in Bizagi called the SAP connector. Before moving on, make sure you have already installed the SAP.NET assemblies, as required by this type of integration. For detailed information and requirements about the SAP connector, refer to SAP connector. 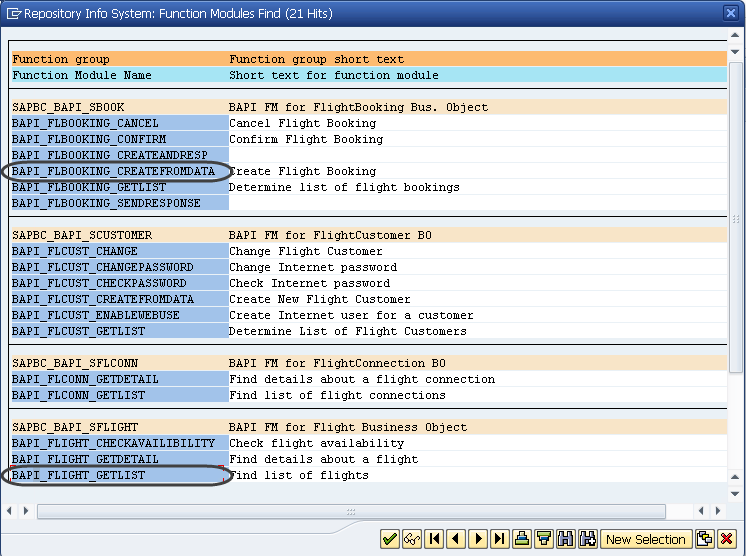 In this example, we will integrate the SAP R/3 (mySAP) Flight Module in a Bizagi process. Our goal is to create a process in Bizagi in which users can search for a given flight and then book it (done in Bizagi through 2 different integration points). 1. First, a petitioner starts the process to search for a flight that meets his or her requirements (date ranges, origin, destination). 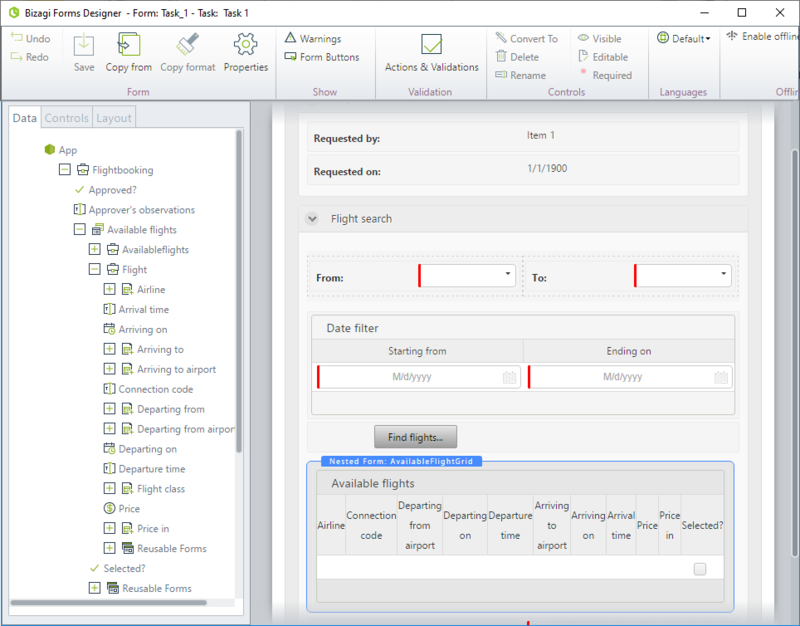 In this same first activity called Request flight, Bizagi will fetch those available flights directly from SAP and present the results (upon the clicking of a button). 2. The second activity called Approve flight is assigned to an approver, who receives this request and approves or rejects it. 3. If approved, Bizagi books the flight (this integration ends up creating a new record in SAP), through an asynchronous task called Book flight in SAP. 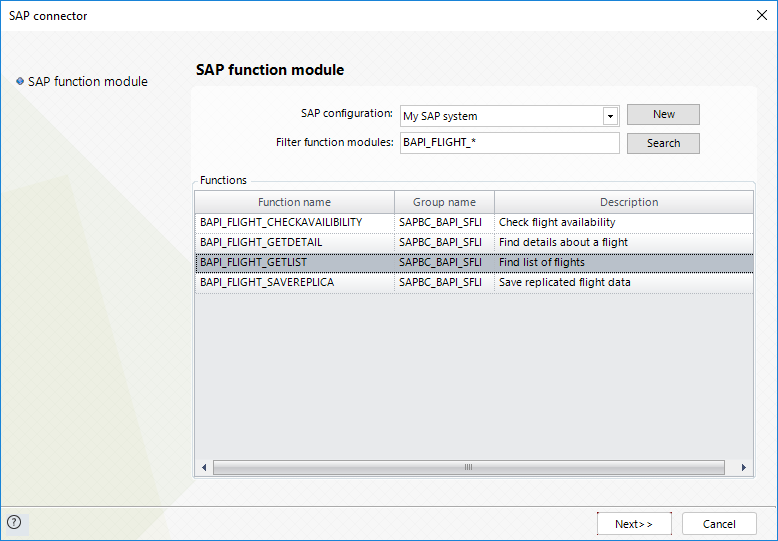 For more information on the flight module that comes installed in SAP for educational purposes, refer to http://wiki.scn.sap.com/wiki/display/ABAP/Flight+Data+Application+-+Demo+Example+for+Integration+Technologies. In this step we basically illustrate how to identify which parameters are involved both to send, and to receive information from SAP (especially as a helpful guide for people who are not necessarily SAP experts). We will look up everything relevant to the functions in SAP we integrate, mainly through the options provided by SAP Logon. 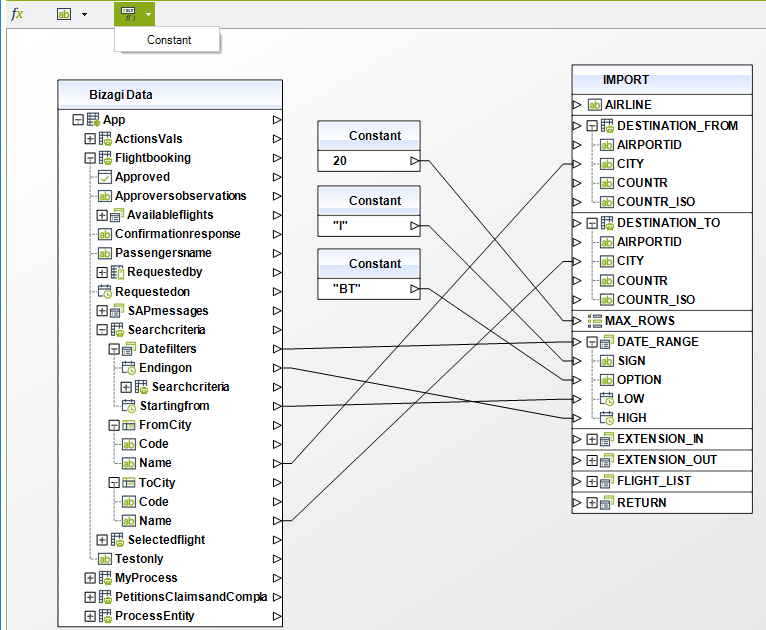 It illustrates the design considerations of our Bizagi data model in this example as well. We will illustrate how to configure the connection to your SAP system. This step is only need once. •Configuration of the BAPIs invocation. 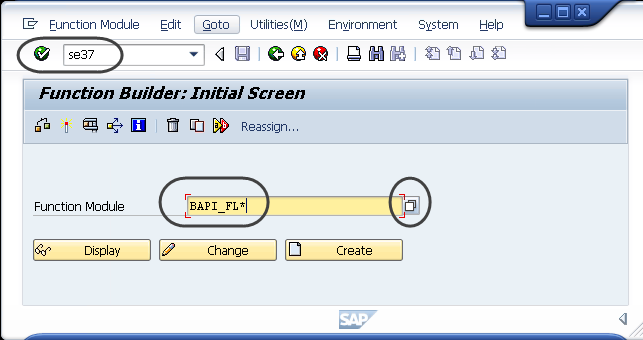 We will illustrate how to configure the invocation of SAP BAPIs from any part of your process. To search for flights, we rely on the BAPI wrapper called BAPI_FLIGHT_GETLIST. 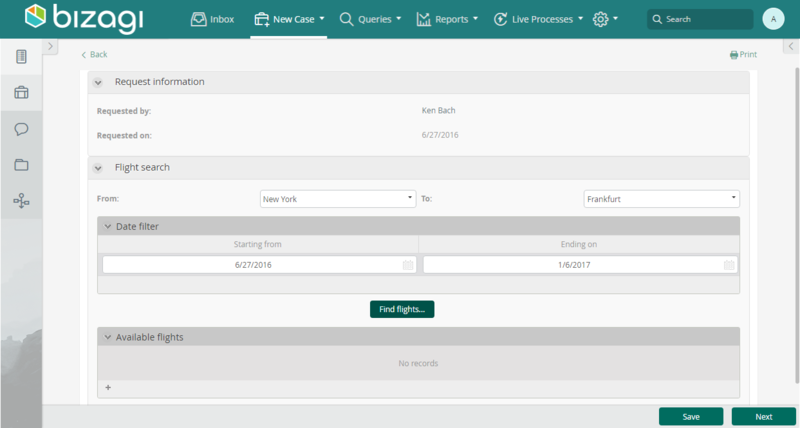 To book a flight, we rely on the BAPI wrapper called BAPI_FLBOOKING_CREATEFROMDATA. 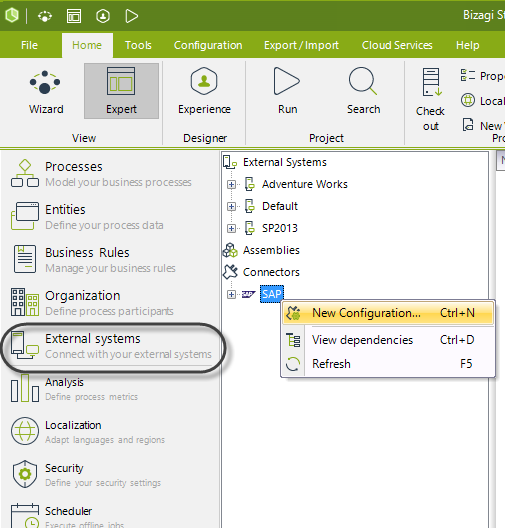 Keep in mind that for the Configuration of the BAPIs invocation, you should have already installed the required SAP.NET assemblies, as described at SAP connector (otherwise, Bizagi Studio won't be able to connect to your SAP system). 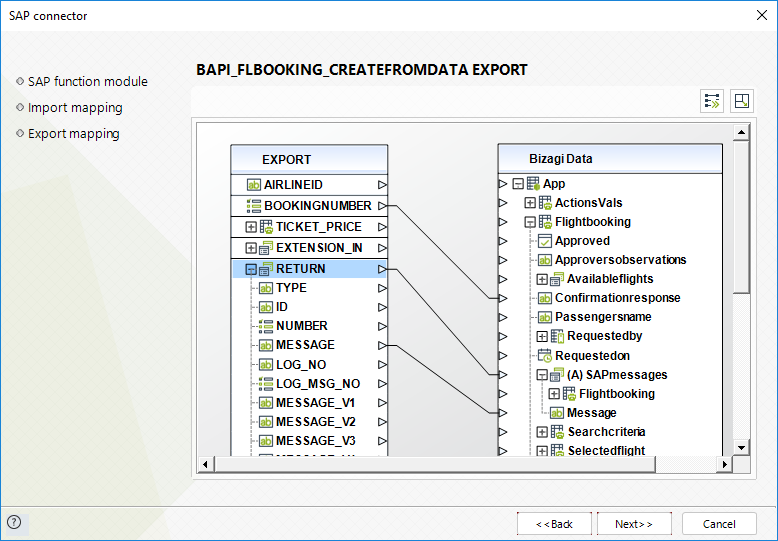 We will need to explicitly identify first, the relevant needed information in order to use the BAPI_FLIGHT_GETLIST and BAPI_FLBOOKING_CREATEFROMDATA BAPIs in SAP (which information is strictly mandatory in its import, export and table parameters). We use SAP Logon to browse the details of these 2 BAPIs. Notice that we will need to consider: Optional and non-optional import parameters, tables we can set as reference, export parameters, and any predefined exceptions to configure in Bizagi error handling. To configure the input parameters of your SAP integration in Bizagi, you need to consider that information presented both in: Import and tables. To configure the output parameters of your SAP integration in Bizagi, you need to consider that information presented both in: Export and tables. Notice you can use the Test/Execute option to validate your results. In our example, we will allow the petitioner to filter available flights according to a chosen range of date, and the departure and arrival city. 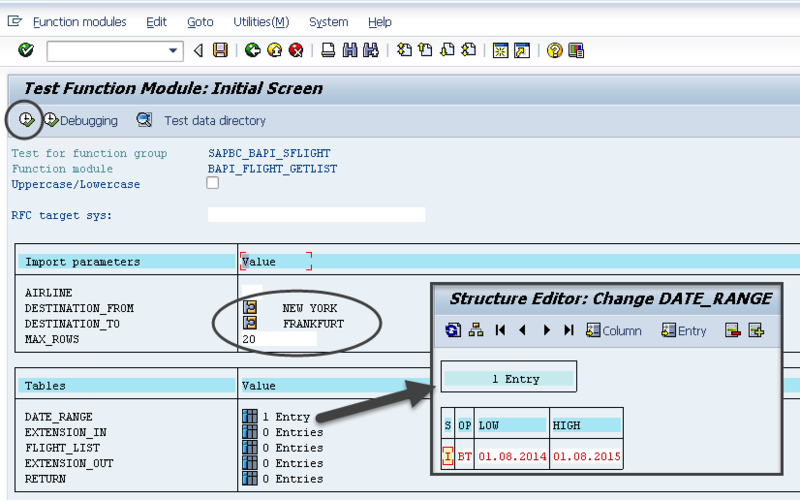 In this specific example, none of the two SAP BAPIs have predefined exceptions. Therefore, in this example we will not be configuring special treatment for failed invocations. For further information about error handling in the SAP connector, refer to: SAP error handling. If you do use the Test/Execute option in SAP Logon, make sure you either commit or rollback the execution before having Bizagi invoke these BAPIs (you may also explicitly close SAP Logon to discard changes). Otherwise, it is likely that some tables and structures are left locked out awaiting for transaction commits. •Our process entity is called FlightBooking. •The Search criteria and Date filters entities store the information that the petitioner enters to filter the flights that suit his or her requirements. •Available flights is a collection that will be filled out with the fetched list of flights from SAP. The one flight marked down by the Selected? 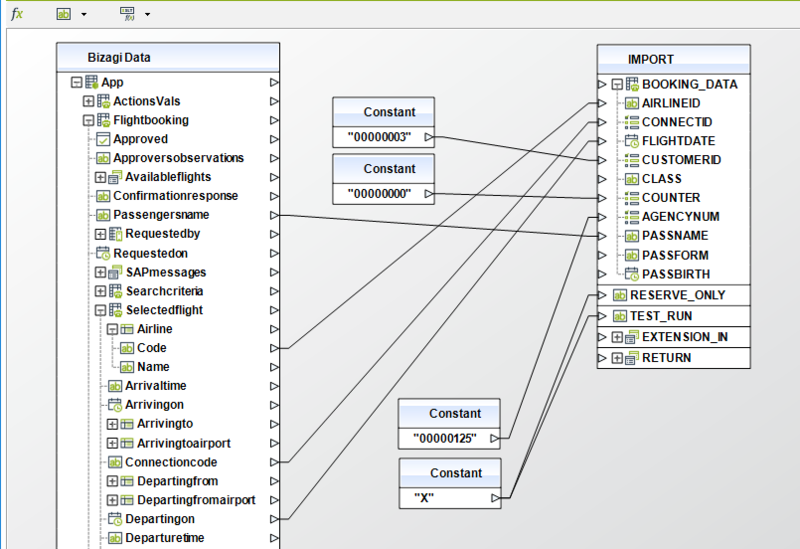 boolean, is set into the Selected flight attribute in the FlightBooking entity. 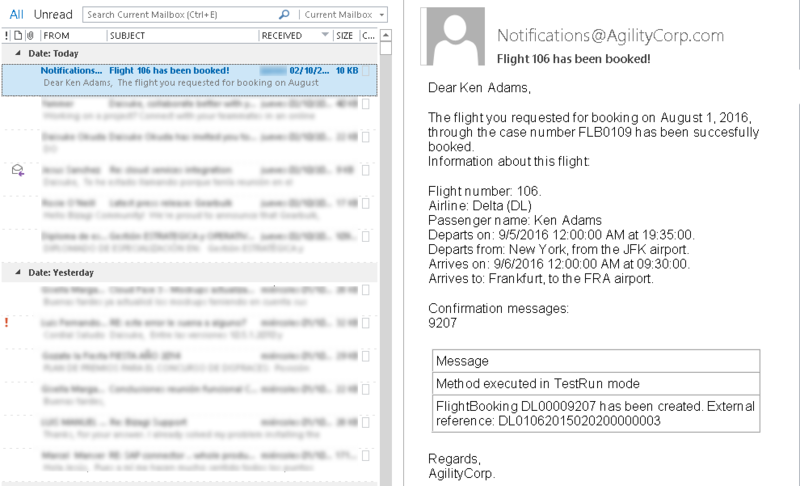 •SAP messages stores the response messages sent by SAP when booking a flight. When this BAPI does not execute successfully, SAP will return more than 1 message specifying detail. 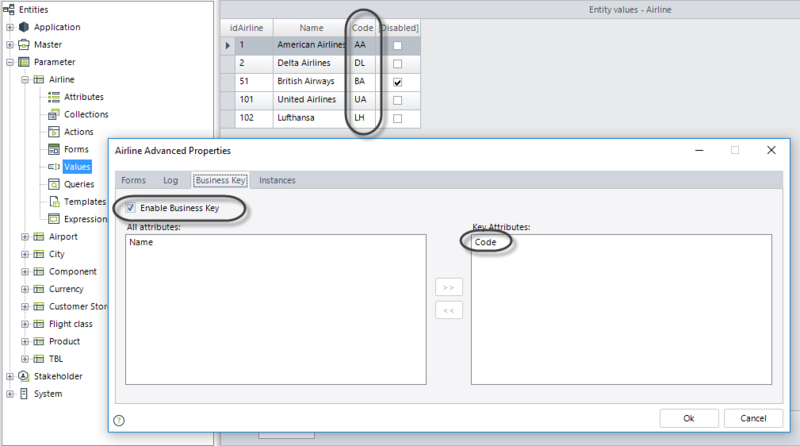 Note that preset values we have included for the Airline entity consider the exact codes that SAP handles for the flight carriers. NEW YORK as a code for New York (USA) and FRANKFURT as the code for Frankfurt (Germany). JFK for the John F. Kennedy airport in New York, and FRA for the Frankfurt airport. Now we enter the connection details for the SAP connector in Bizagi. To do this, go to the Expert view and locate the External systems module. In the panel to its right, locate SAP under the Connectors item. •App Server Host: The IP address or name of your Server hosting your SAP system. •Client: The number of the client accessing the SAP system. •Idle timeout: The timeout in seconds for idle connections. By default, you may assign a value of 600. •Language: The 2-letter ISO code that represents the language setting (as inputted when accessing SAP through SAP Logon). •Peak connections limit: The maximum number of connections you will allow through the SAP connector. By default, you may assign a value of 10 connections. •Pool size: The number of connections that will be handled for reuse. By default, you may assign a value of 5. •System number: The number of your SAP system. •User: An authorized SAP user to access and invoke BAPIs or RFCs. This SAP user configured here will be used as the service account of this connector. •User Password: The password for that authorized SAP user. Notice you may use different configuration parameters for each of your project environment (development, test and production). First at the Request flight activity, by invoking BAPI_FLIGHT_GETLIST when the petitioner clicks a button. 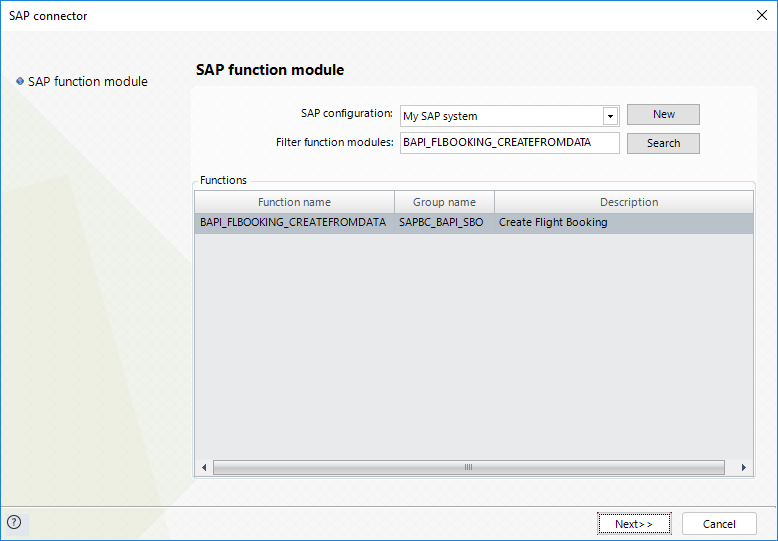 Then, at the asynchronous task called Book flight in SAP where the system automatically invokes BAPI_FLBOOKING_CREATEFROMDATA (no user interface). 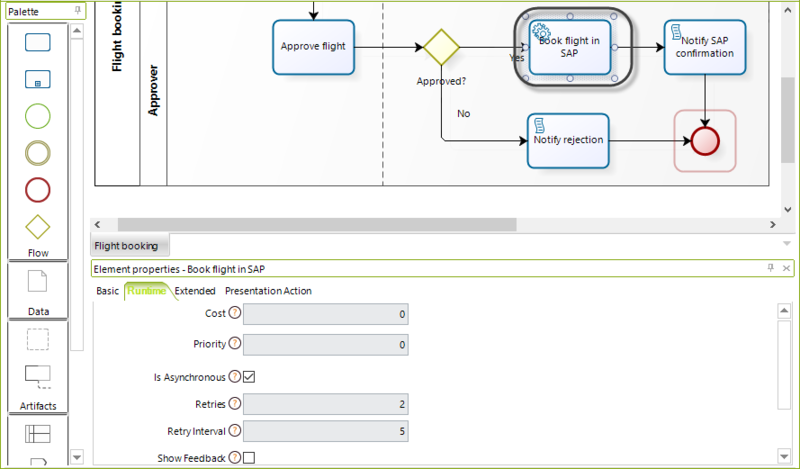 Through the Actions and validations, we set the invocation of a SAP BAPI upon a given change or action in the user interfaces. In this example, we will invoke SAP when the above button is clicked. 1. Select the SAP configuration. This means choosing the configuration of the connection for SAP, as initially done at the External systems module. 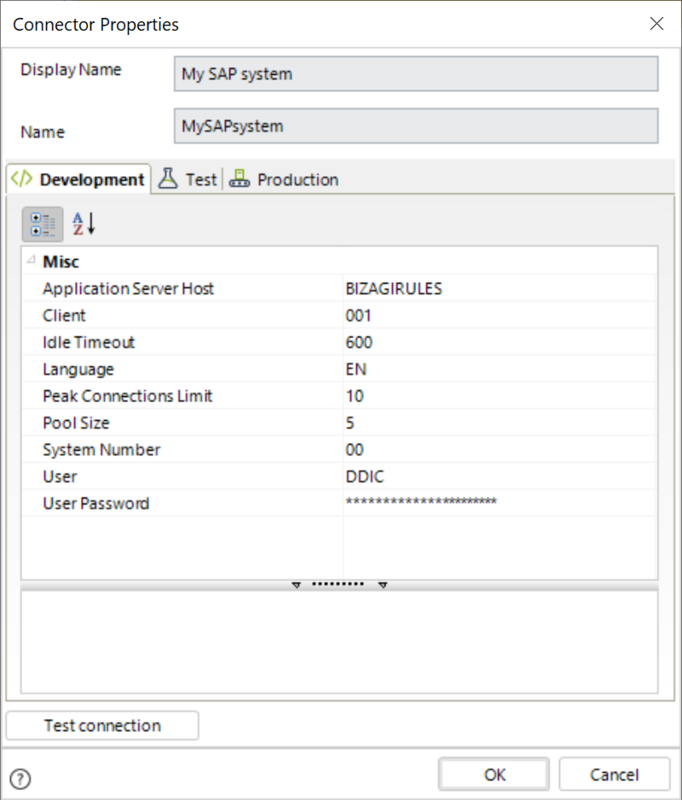 By default the predefined SAP configuration is selected, and this option will additionally come in handy in case you have multiple SAP systems to connect to. Notice you may create a new configuration from the New shortcut button. 2. Select the function module. Use the search box to filter and search for the function module you wish to invoke in SAP. Recall that any RFC or BAPI wrapper will be listed, provided that you have properly configured the connection with a user with enough rights. Click Search to list the matching function modules. Choose the desired one and click Next. Notice you may use in the Search box, any SAP wildcard characters such as *, + or #. 3. Map the Import parameters. 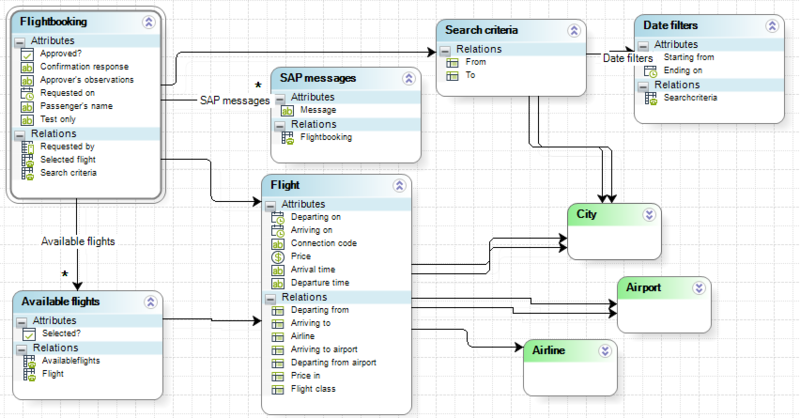 Use the graphical mapping to map inputs for your SAP function module. Keep in mind that parameters passed on as reference to this function module, through SAP's tables, are presented in this step as well. Notice in this example we rely on the Constant functions to map the Max_Rows and other inputs which we won't be leaving up for the end user's configuration. 4. Map the Export parameters. 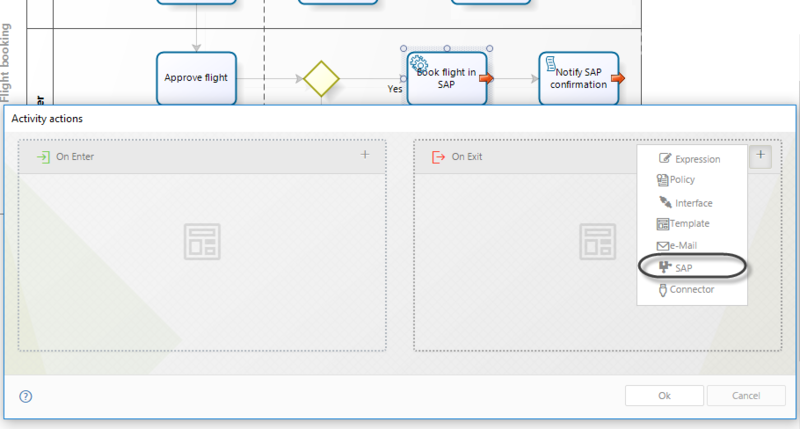 Use the graphical mapping to map output of your SAP function module into Bizagi. Keep in mind that parameters passed on back as reference by this function module, through SAP's tables, are presented in this step as well. Recall that this BAPI merely executes a query and it does not create new records in SAP. Notice we map an array of flights into our collection of available flights. 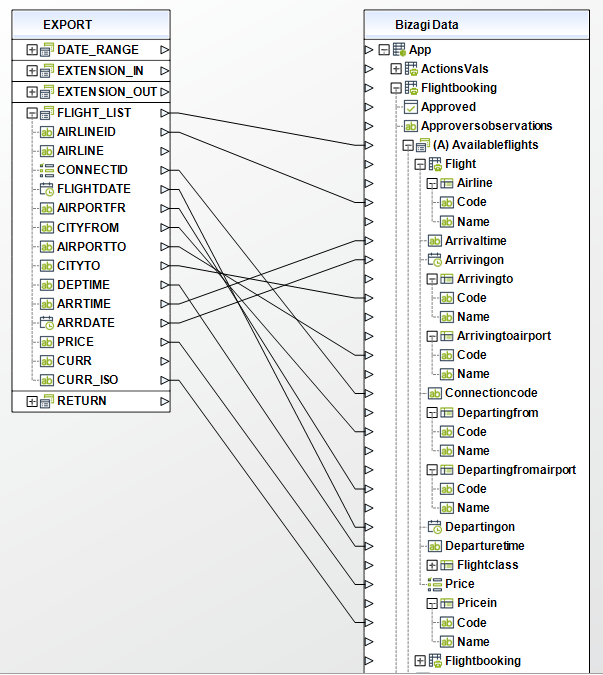 Should there be no available flights matching the end user's criteria, the table representing the collection of available flights in the user interfaces will be left empty. Through this idea, there is no need to configure special error handling treatment. Click Next and skip the error handling configuration by clicking Finish. For more information about this possibility, refer to Advanced mapping. A couple of additional activity actions are configured for this process. These activity actions are secondary and not part of the integration with SAP (we will not focus on these). •A business rule upon approval of the flight booking request, so that the selected flight is assigned to the Selectedflight attribute of our data model. •Setting an e-mail notification at the Notify SAP confirmation script task, in order to send to the petitioner an e-mail with the information related to his/her booking confirmation. 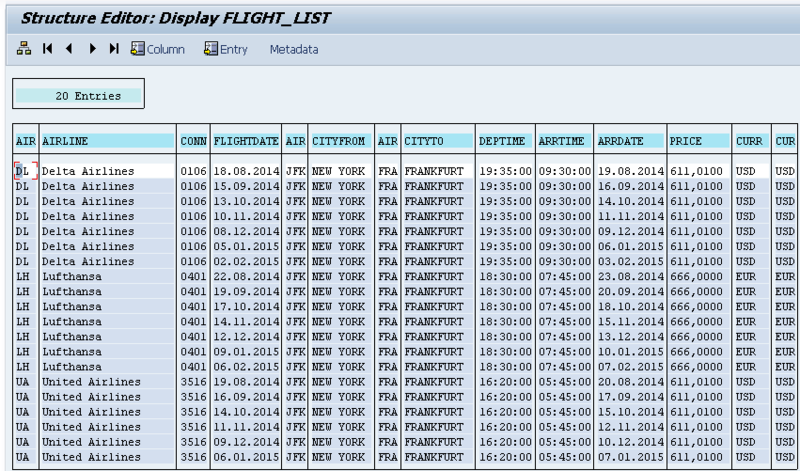 •Setting the system's date and the petitioner's information into the flight request data. We use the same SAP connection configuration. We search for BAPI_FLBOOKING_CREATEFROMDATA and select it. Notice in this example we rely on the Constant functions to map the Customerid, Counter and Agencynum, or other inputs which we won't be leaving up for the end user's configuration. For instance, notice you may send out an X to mark this invocation as a test run and reserve only. 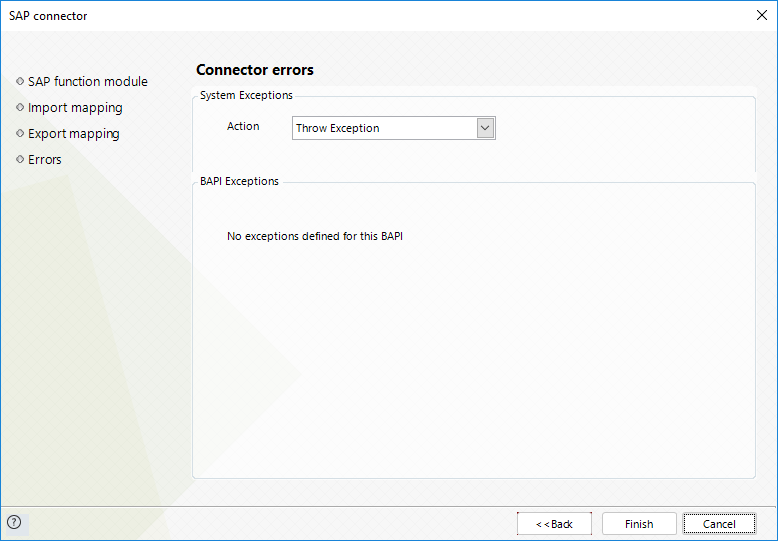 Finally, and since this specific BAPI did not have any predefined SAP exceptions (as looked up in the Preparation steps), we will not be handling for this BAPI any functional errors. So we leave the default Throw exception option to handle any error during the invocation of this BAPI and click Finish. Should there be an error during the invocation, the asynchronous task will be automatically retried by Bizagi. At this point we have integrated Bizagi with SAP through the SAP connector which avoids the need of programming. To learn about configuring error handling for SAP integration (if BAPIs have predefined functional exceptions), refer to SAP exceptions configuration. 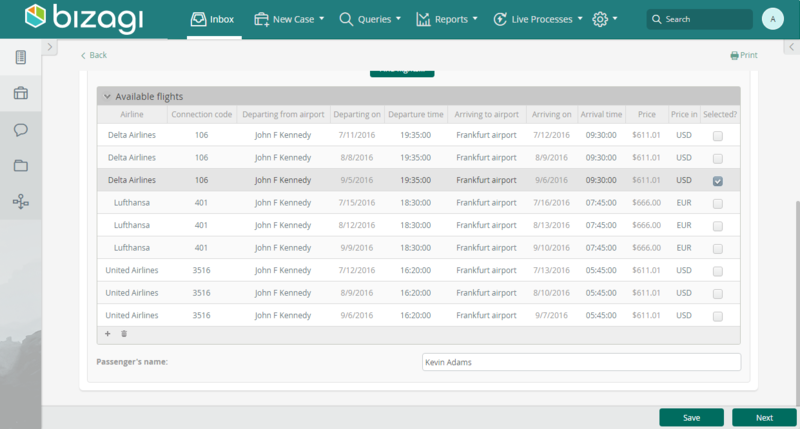 Once the flight booking is verified by an approver, Bizagi processes the booking. Keep in mind that you should have already installed the SAP.NET assemblies required for execution, in order for the SAP connector to work in Bizagi. Further information about this installation is described at SAP connector.